Sometimes you just can't keep a good thing down. Particularly when it's a hazy IPA in the current climate. This beer first appeared as a one-off collab between Capital and Royal Blood when the band was in Australia for the Groovin' The Moo festival series in 2018. 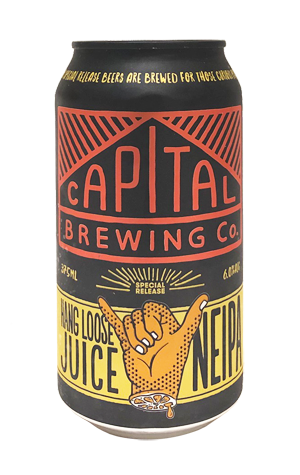 It stood out from many band collabs, where keeping things toned down has been part of the aim, instead ratcheting up the juice factor to deliver a NEIPA with such character and potency it was brought back as Hang Loose Juice and notched a spot in our Best New ACT Beers Of 2018 list. Hang Loose has stepped up again in 2019, becoming the brewery's first limited can release of the year – complete with accompanying hang loose gesture as part of the artwork (also referred to as the shaka / ridgy didge and The Crafty Pint team's official "Acknowledged" shorthand in any email / text conversation). And you can only see its popularity rising again. Deeper orange in hue than many NEIPAs, the blood orange additions dominate from the off – it's like popping your head over a bowl of freshly shredded fruit – with some pineapple and pine lingering in the background, courtesy of a double dry-hop featuring Galaxy, Mosaic and El Dorado in greater volume that any other Capital beer to date. It's as textural as it is deeply hazy, with a slow-building bitterness that has more of the IPA about it than some of its hazy brethren, adding a touch of balance to the no-holds-barred juice assault.